Professionals and anywhere in between – need to have a ? rm grasp on current events as they impact their livelihoods. If you are one of those professionals, then you’ve come to the right place. 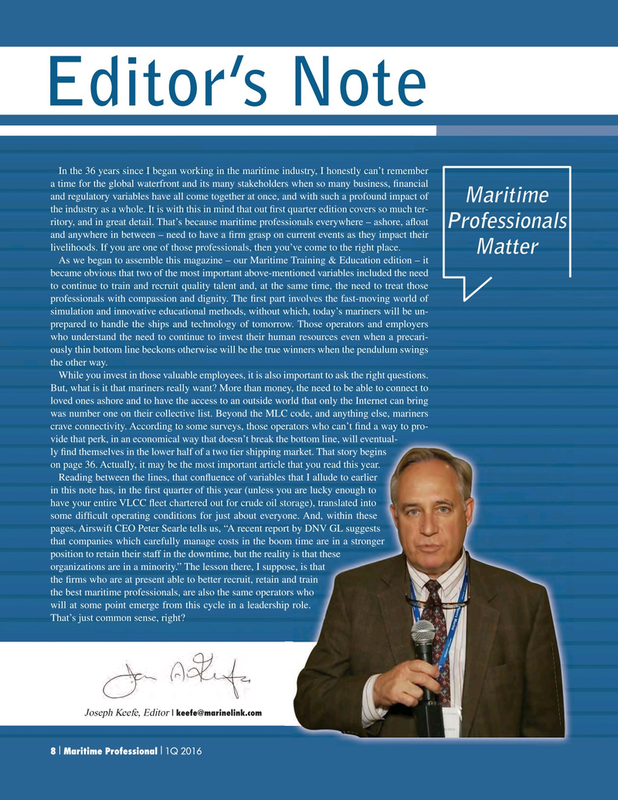 As we began to assemble this magazine – our Maritime Training & Education edition – it became obvious that two of the most important above-mentioned variables included the need to continue to train and recruit quality talent and, at the same time, the need to treat those professionals with compassion and dignity. The ? rst part involves the fast-moving world of simulation and innovative educational methods, without which, today’s mariners will be un- prepared to handle the ships and technology of tomorrow. Those operators and employers who understand the need to continue to invest their human resources even when a precari- ously thin bottom line beckons otherwise will be the true winners when the pendulum swings the other way. While you invest in those valuable employees, it is also important to ask the right questions. But, what is it that mariners really want? More than money, the need to be able to connect to loved ones ashore and to have the access to an outside world that only the Internet can bring was number one on their collective list. Beyond the MLC code, and anything else, mariners crave connectivity. According to some surveys, those operators who can’t ? nd a way to pro- vide that perk, in an economical way that doesn’t break the bottom line, will eventual-e bottom line, will eventual- ly ? nd themselves in the lower half of a two tier shipping market. That story begins ma arket. That story begins on page 36. Actually, it may be the most important article that you read this year.e th hat you read this year. Reading between the lines, that con? uence of variables that I allude to earlier s th hat I allude to earlier lkh ou are lucky enough to in this note has, in the ? rst quarter of this year (unless you are lucky enough to tor rage), translated into have your entire VLCC ? eet chartered out for crude oil storage), translated into one e. And, within these some dif? cult operating conditions for just about everyone. And, within these rt b by DNV GL suggests pages, Airswift CEO Peter Searle tells us, “A recent report by DNV GL suggests that companies which carefully manage costs in the boom time are in a stronger m time are in a stronger ty i is that these position to retain their staff in the downtime, but the reality is that these organizations are in a minority.” The lesson there, I suppose, is that ose e, is that and d train the ? rms who are at present able to better recruit, retain and train the best maritime professionals, are also the same operators who ors s who will at some point emerge from this cycle in a leadership role. p r role.